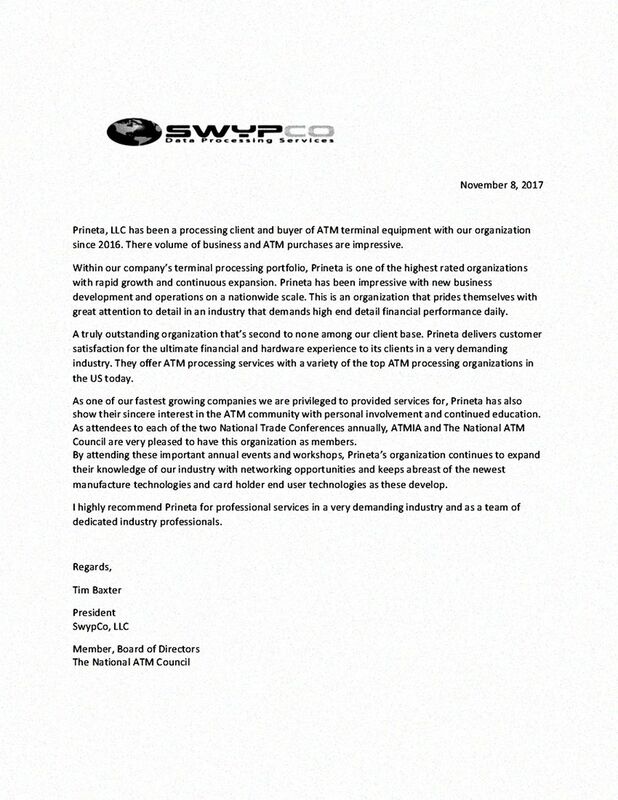 “Prineta, LLC has been a processing client and buyer of ATM terminal equipment with our organization since 2016. There volume of business and ATM purchases are impressive. Within our company’s terminal processing portfolio, Prineta is one of the highest rated organizations with rapid growth and continuous expansion. Prineta has been impressive with new business development and operations on a nationwide scale. This is an organization that prides themselves with great attention to detail in an industry that demands high end detail financial performance daily. A truly outstanding organization that’s second to none among our client base. Prineta delivers customer satisfaction for the ultimate financial and hardware experience to its clients in a very demanding industry. They offer ATM processing services with a variety of the top ATM processing organizations in the US today. 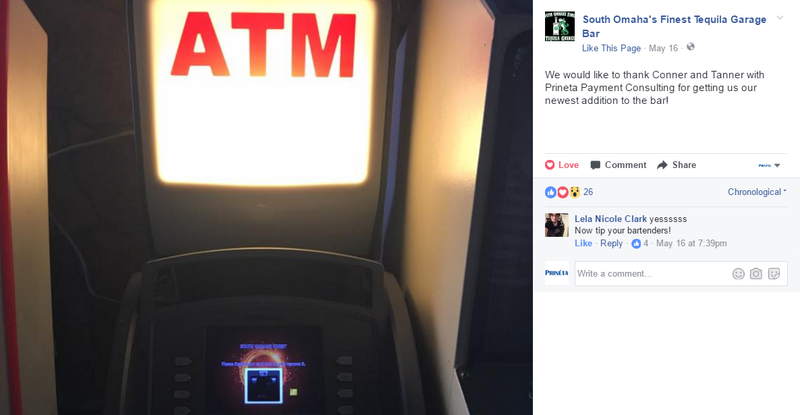 As one of our fastest growing companies we are privileged to provided services for, Prineta has also show their sincere interest in the ATM community with personal involvement and continued education. As attendees to each of the two National Trade Conferences annually, ATMIA and The National ATM Council are very pleased to have this organization as members. By attending these important annual events and workshops, Prineta’s organization continues to expand their knowledge of our industry with networking opportunities and keeps abreast of the newest manufacture technologies and card holder end user technologies as these develop. This is a great company with amazing customer service, Connor and Tanner are very helpful and good at what they do. I cannot say enough about the service we received and I will be recommending them to everyone I know. 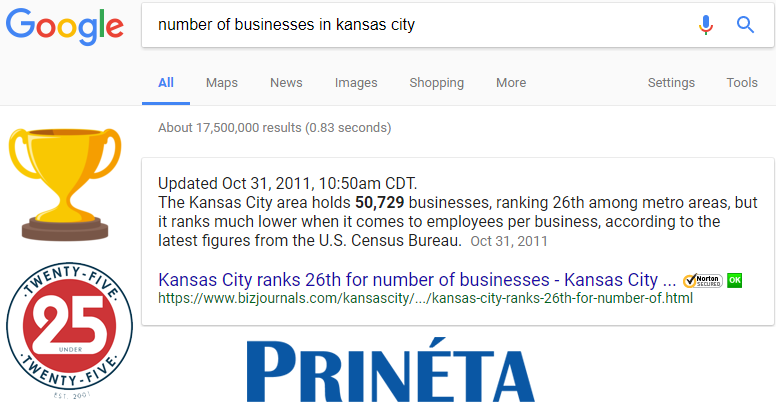 Prineta has been a great company to work with. 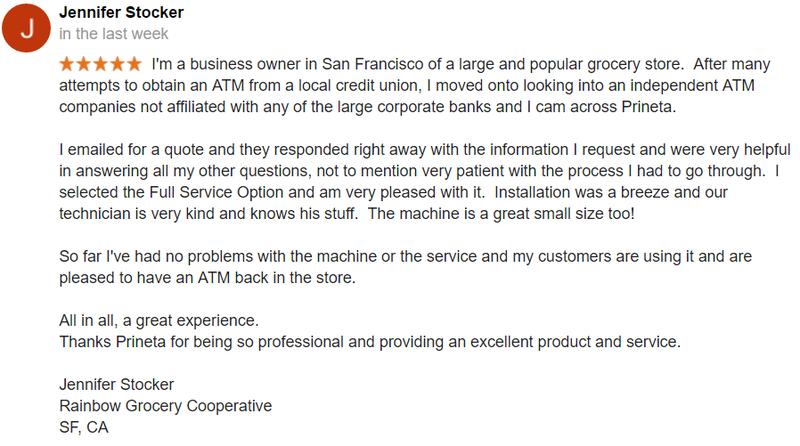 Conner walked me through the purchase of my first ATM and has provided excellent customer service. I look forward to my next ATM purchases and continued processing with this company.